Dr. Bettina Pels-Wetzel has a B.S. degree from Boston College as well as a D.D.S. degree from New York University. She was awarded the Italian Dental Society of New York Award recognizing the "high level of academic excellence and professional conduct", and upon graduation from dental school, completed her general practice residency at Goldwater Memorial Hospital/NYU Medical Center in New York City. 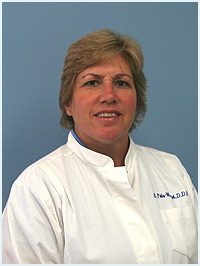 Dr. Pels-Wetzel has been in private practice since 1986 in Schenectady, New York. Dr. Pels-Wetzel was involved with the Cleft Palate clinic initially at Sunnyview Hospital, then at St. Clares Hospital. For over 20 years, she was a Fourth District Dental Society Newsletter editor, and on the state level, was a member of the Publication Council of the NYS Dental Association. She is also an active member of the Schenectady County Dental Society, Ellis Medicine Dental Implant Study Club, Schenectady Dental Study Club, Fourth District Dental Society, NYS Dental Association and the American Dental Association. Dr. Pels-Wetzel was honored and inducted as a fellow of the Pierre Fouchard Academy and the American College of Dentists. She has continued her dental education, completed over 500 hours in disciplines such as implant dentistry, restorations, as well as subjects medically related to dentistry. Bettina has two children, enjoys playing tennis, skiing, hiking, water sports, gardening, photography, reading and walking her dog, Ollie.